Meeting re: HR589 is over-update from crew of 42!! Re: Meeting re: HR589 is over-update from crew of 42!! Re: It is Official! Meeting tomorrow for HR 589! Please Start Contacting NOW! Tweeted from rep Babara Lee and the crew of 42. Contact Boehner and Cantor TONIGHT! Feeling better now that I found this site again. Ihope something comes of this meeting. I so dont want to be disappointed again. nuttin2lose wrote: There are reports Rep Lee has tweeted the meeting will be in the AM. Can anyone confirm? A freshman Republican congressman from Wisconsin has broken rank with his GOP colleagues by calling on lawmakers to re-evaulate the multi-billion-dollar subsidies the federal government doles out to already highly-profitable oil and gas companies. Rep. Reid Ribble said on C-SPAN's Washington Journal last week that the subsidies should be "looked at" -- which, in the context of the modern Republican Party's lockstep adherence to Big Oil's political agenda, was actually news. Ribble's spokesman Brandon Moody on Tuesday confirmed that the congressman is serious about the idea. nuttin2lose wrote: As the President just said in his speech, we can not forget those hurting the most, and have the least political pull in Washington. 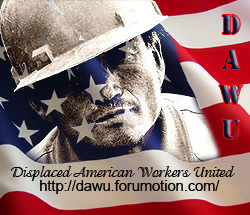 Let them know who we are, that we are here, we need this bill to survive, AND JOBS to get our lives back. Location : Hills of Eastern Ky.
Job/hobbies : Reading . Can't afford anything else! I've been super busy with my job search (trying to make something happen). I just stopped in to see what was happening with everyone and I am so happy to hear about the meeting tomorrow morning! I am praying that this happens for us. We all need this so much. Kimmymc wrote: I've been super busy with my job search (trying to make something happen). I just stopped in to see what was happening with everyone and I am so happy to hear about the meeting tomorrow morning! I am praying that this happens for us. We all need this so much. Hi Kimmygirl, nice to hear from ya! Why is this important for the 99ers? Because the volatile and completely unpredictable nature of the ongoing budget debate over the next few days can easily interfere with the much anticipated meeting. Hi Bonnie! I hope you are doing well. Let's hope for some positive news tomorrow! Congress goes on Spring Recess beginning Monday, April 18th and will not return until Monday, May 2nd. I sure hope the meeting goes expeditiously tomorrow. Now I am Bonnie again, gotta find my wig! Anyway dont you think these clowns have had enough and just pass it and go on to other matters? It cant be that big of a deal with the wars and everything. OK sounds too simple! Sorry Boonie, it's late. Didn't mean to type your name incorrectly. Yea, you would think this bill would be passed immediately, but honestly, our country isn't what it used to be. It's all about power and greed and not about the American people who keep the economy going and put them in office (and pay their paycheck!). my prayers are with you. if we all pray together we can make this happen. it is good for us the americans trying to find a job and it is good for america as Biden sleeps as our prez tries to speak? For those that have not seen this. GET BUSY CONTACTING!! nuttin2lose wrote: For those that have not seen this. GET BUST CONTACTING!! With last weeks unemployment first time claim numbers back up to 412k , how can they say it's getting better . This needs to be passed along with a tier 5 .. unlimited number of weeks , till the billionaires that create jobs get unemployment numbers verifiably below or at 5% in this country ! This is good to know, just praying something good comes out of this meeting , and real job creation starts real soon ! We need this till we are back to work at a livable wage ! does anyone know when todays meeting will start?